In the article For the Athlete Who Has It All Wall Street Journal reporter and avid fitness swimmer, Kevin Helliker states “Like many fitness swimmers, I can go mile after mile of freestyle without stopping. But a single lap of the butterfly stroke leaves me gasping.” According to the article, “long-distance butterfly swimming is becoming a new and less-crowded frontier for fitness fanatics.” Helliker went looking for insight on how he could join the crowd of fitness flyers. As you can see in the article, the advice he received might not have been that encouraging to those who, like him, are left “gasping” by a single length. Most just reinforced the idea that there’s not much to be done but work harder to survive that ordeal. When Helliker asked me if I thought an adult could learn to swim butterfly for distance, here’s what I offered – a small part of which made it into the article. Five years ago, after much experimentation and one eye-opening insight, I began developing an adapted version I called Butterfly for Boomers. Background: I had striven since I began swimming at age 14 to find some way to swim butterfly that didn’t exhaust me after 25 or 50 yards. Despite many faithful repetitions of 25- and 50-yard repeats to get in better “butterfly condition” plus countless cumulative hours of all the usual fly drills – single arm, triple kick . . . and despite having coached some amazingly fast flyers, including one who was world-ranked in the mid-80s . . . that goal eluded me for 40 yrs. Five years ago, age 54, I was watching a DVD of Michael Phelps, advancing frame-by-frame, and noticed something I’d never discerned before. I saw that after landing, he simply held a streamline – for a nanosecond – while allowing himself to sink. And that after sinking, he rose again — without trying to climb back to the surface. What I took from this was that Phelps was swimming fly in a fundamentally different way – a difference that was sufficiently subtle that he probably wasn’t consciously aware of it. In essence he had turned butterfly into a way to play off the natural forces of Gravity and Buoyancy against each other. – Land Forward. Don’t dive in – as many swimmers do. Since gravity would return me to the water anyway, there’s no reason to dive. – Hold a Streamline while sinking. To ensure I’d continue traveling forward while I sank. – Wait until I felt that the force of Buoyancy (acting on the air in my lungs) was stronger than that of gravity. – Begin next stroke just at the moment I felt my head about to break the surface – purely via the assist from buoyancy. You can see both of these occur between 32 and 52 seconds on the youtube video. Within 10 minutes I found myself able to just keep swimming in the current (no walls, therefore no regular rest breaks) with no fatigue nor any reason to stop other than a desire to do something else. I later added other elements – such as don’t “pull” – just use your hands, as gently and briefly as possible, to “help” your head emerge. I also added the Butterfrog adaptation – which was far better suited to my non-supple middle-aged lower back. The breaststroke kick even turned an immobile back (my hips refused to undulate even at 15) into an asset, rather than impediment. At 15 – as well as 25, 35 and 45 – I was unable to swim even 100 yards in anything other than desperately-hanging-on mode on the final 25. 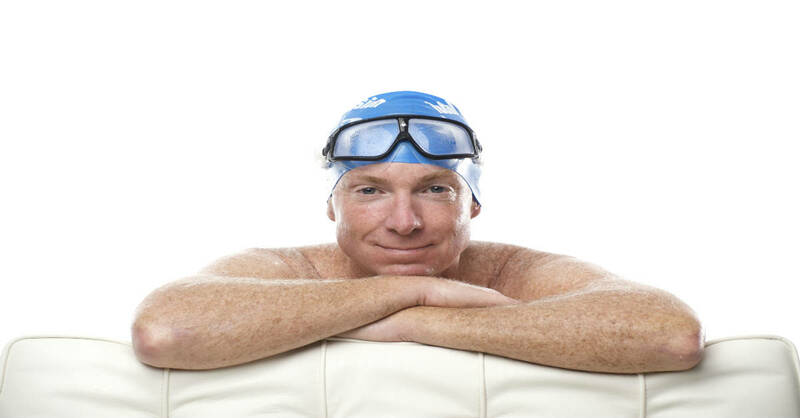 At 55 I regularly swam 200 yards of Butterfrog in practice and entered the 200 Fly in Masters meets 3 times. I won the gold in my age group and improved my PR each time. And the 3rd time I swam progressively faster splits on the 2nd, 3rd and 4th 50s, something most people would think only a Mary T or Phelps would be capable of. You can imagine what a heady experience this was. I view this within a larger frame — that is how to rethink and re-engineer a variety of sports-related skills to adapt to physical changes that occur as we age. I find an amazing amount of possibility for this in swimming, because one can finesse drag to a far greater extent than one can finesse gravity, and because of the yielding nature of water. For instance we call our latest iteration of crawl technique “Perpetual Motion Freestyle” because it’s so well adapted to swimming longer distances with little or no fatigue and significantly easier on the body than conventional crawl. This WORKS! I went from struggle to sweeet in my butterfly! Thanks Terry! Very well written..!! You are a great swimmer. Thanks for the advice Terry. This is great! Swimmers often have such a hard time with this stroke, nice to hear some tips! Thanks. Swimming long distance butterfly is in reach for any distance swimmer. Last year I was 56 when I did my 36 miler all butterfly. In June of this year, at age 57, I will do it again.